After a distasteful comment stating Sen. John McCain's brain cancer diagnosis is the reason for his "newfound" courage in opposing certain legislation put forward by the GOP, a House Democratic candidate from Minnesota is issuing an apology. Dean Phillips, who's challenging incumbent Rep. Erik Paulsen (R-MN) for his House seat, stated during a meeting with supporters that he has been voicing support for current senators who have been challenging President Trump and the Republican party when it comes to passing legislation. "I've been tweeting on occasion, about saluting [Senators] Bob Corker, and John McCain, and Jeff Flake," said Phillips. "Men who have shown a little bit of courage speaking truth to their own party..."
In the next breath came the comment that may follow Phillips for the rest of his campaign. "But it shouldn't take brain cancer, and the retirement from the Senate to do so," he remarked. Sen. McCain (R-AZ) has served in the Senate for three decades, taking office for the first time in January 1987. A man who served our country in Vietnam and was tortured as a prisoner of war for years by the Vietcong, Sen. McCain has possessed the courage to stand up for what he believes in inside and outside the world of politics. His voting record is a mile long, and throughout his time in the Senate, he has not merely toed the party line. 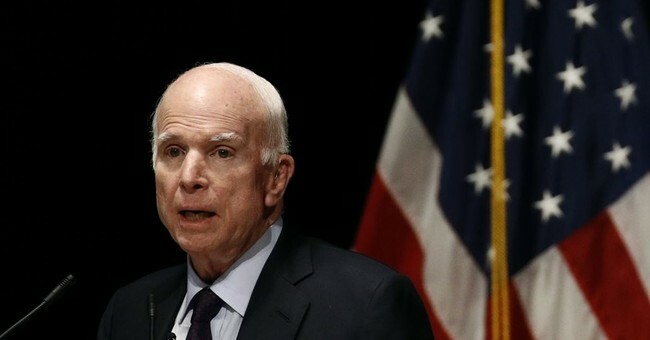 Regardless of one's thoughts on Sen. McCain's political views or track record on legislation, insinuating that Sen. McCain has not held to his convictions and not had the courage to vote his conscience until receiving the horrific diagnosis of brain cancer is egregious. First and foremost, I apologize to Sen. McCain for referencing his health, which I should not have done. I greatly admire Sen. McCain's service to our country as well as his courage and have for a long time. The point I was trying to make is that too many Republicans in Congress today — unlike Sen. McCain, Sen. [Susan] Collins and a few others — have shown a troubling lack of courage and willingness to stand up for their constituents, including when it comes to protecting their access to affordable healthcare. My sincere hope is that many more will join them in putting their country before their party. The Washington Examiner has also reported that Rep. Paulsen is favored to win reelection.